We’ve just returned from a remarkable trip to Bermuda, where Samantha and I got engaged, and, frankly, we fell in love with the place. The colors, the scents, the sounds, and the magical experiences we had — a bit like Alice in her Wonderland, actually, just took us deeper and deeper. One such experience was meeting Tom Butterfield and Elise Outerbridge of the Masterworks Museum of Bermuda Art, which has as part of its mission the repatriation of works created by world renowned artists in Bermuda. 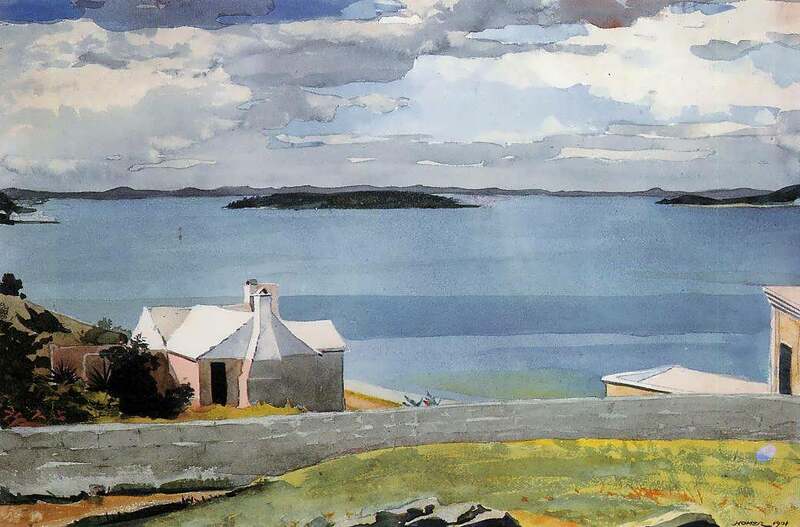 When we were there, Tom was hanging a show of Brooklyn artist Ogden Pleissner’s watercolors painted at St. George’s on the far eastern part of the country. He took us down into the archives to see Georgia O’Keefe’s charcoal of a banyan tree, and Winslow Homer’s “Inland Water,” which was painted not far from where we were staying in Warwick Parish. Samantha challenged me to write poetry inspired by Bermuda — not easy to do after a month of writing a poem-a-day during the month of April. But when we got home, my notes proved to have some gems. And cliché, until you see it’s true. Not since Indonesia have I seen such a color. Rain; the islands’ only source of fresh water. By this land- and seascape. In the painting we saw at Masterworks. Which scents the towels during our stay. With our Dark ‘n’ Stormies. and all of our sensibilities. And who wouldn’t love to have a poem rich with images like these, to remember the occasion by?